In February 2007 the Valley was declared a Private Forest Reserve with it's natural values being protected under covenant in perpetuity. Below are some objectives for the management of the reserve. Also refer to Forest Communities, Flora and Fauna pages. Protection and conservation of the Reserve's natural systems and features including the diversity of species, habitats and communities. Protection of significant vegetation communities and populations of threatened and/or priority plant and animal species. 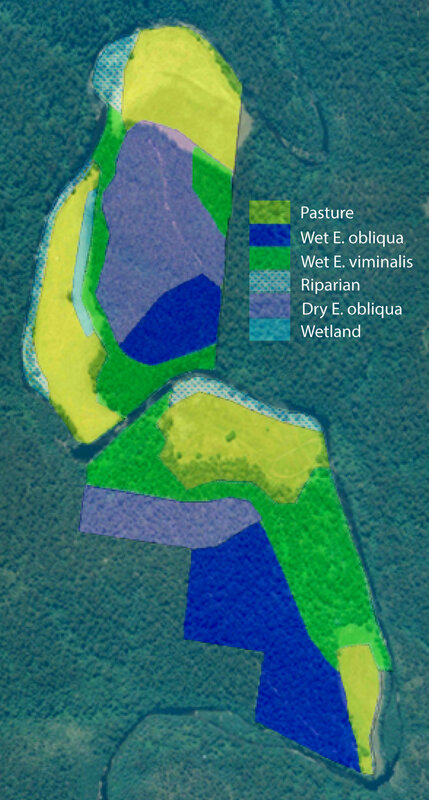 Protection of the Reserve from damage by introduced plants and animals, disease and inappropriate management regimes. To maintain the structure of the forest and allow for regeneration of native species under the proposed management regime. To prevent the forest stand from being frequently burnt. To eradicate or control weeds and feral animals and prevent any further introduction of exotic species. To protect the habitat of threatened and/or priority species. An extensive plan for re-afforestation of some river flat areas is currently being developed with the help of community groups. We are also working with volunteers to help manage the foxglove issue, made worse by three major floods in the past seven years. If you are interested in land care and would like to volunteer please visit our support page. The Valley is also a member of 'Land for Wildlife' and we are working with local wildlife carer, Oma Rodger, providing a safe place to release rehabilitated animals. We had our first release of eight wallabies in September 2016 and look forward to many more. If you are able to help support Oma with her work, or are interested in becoming a carer, please visit the Tasmanian Wildlife Rehabilitation Council inc.